What a great show coming to the Philadelphia region! Scooby Doo is hitting up Sands Bethlehem Events Center on February 8, 2013 at 4p & 7p. In this exciting new show, SCOOBY-DOO and the Mystery Inc. Gang have been called upon to help solve an epic mystery. A trouble-making ghost is haunting a local theatre and SHAGGY, FRED, DAPHNE, VELMA and SCOOBY-DOO are on their way in the MYSTERY MACHINE to help solve it! 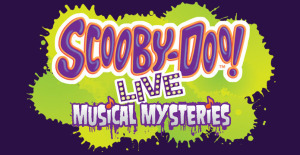 Scheduled to tour North American theatres for the first time in 2013, SCOOBY-DOO LIVE! MUSICAL MYSTERIES features a cast of world-class musical theatre professionals, clever staging, and heaps of spooky special effects in a live show that will have fans howling for more! Be sure to grab your tickets NOW for this fun show! WIN IT: Want to win tickets to the show? Leave in the comments section your favorite Scooby Doo memory! On Friday January 25th one winner will be selected via www.Random.org!